Hello... Hello ... my old friends ... It's great to see you once again! Any artiste who can transform an Eighties Elton John effort into a Bluegrass standard is indeed worthy of note. Yours Truly KJS decided yesterday that it was about time that ELO Beatles Forever [ELOBF] checked out Paul Parker [but without all those right friends] at one of his acoustic duo gigs [with his wife Adelle] at The Bassa Villa over in Bridgnorth. And it was a decision that was more than justified too! 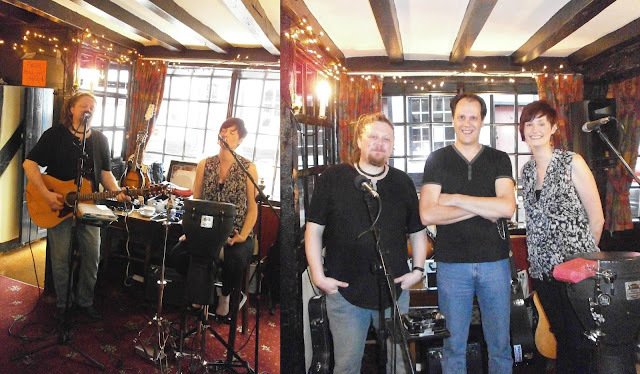 With Paul's vocals, mandolin, acoustic and steel guitar and Adelle's vocals, harmonica and percussion; we were treated to a superb trawl through folk, blues, rock and even pop classics - all interpreted wonderfully in an intimate, unplugged live session. With an extensive roster that included not only original Paul Parker compositions "Shame" and "Fullness Of Love" [amongst others], the duo performed innovative interpretations of songs by a wide range of artistes from The Who to Bruce Springsteen to The Beatles to The Rolling Stones to The Jayhawks to Dire Straits to Bob Dylan and not few others. ELO Beatles Forever [ELOBF] recommends Paul Parker and All the Right Friends to those enlightened folks who also like ELO, Jeff Lynne, Roy Wood, 'Brum Beat', The Idle Race, The Move, The Beatles and related artistes.